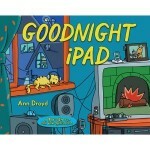 At a family gathering over the weekend, my sister brought a recently purchased copy of Goodnight iPad, a parody of the children’s classic Goodnight Moon. As parents of toddlers, we all browsed the pages, laughing at the updated “goodnight iPhone, goodnight charger…” text and graphics. However, while a part of me saw the humor in the book, and I admit, recognized how my own 3 and 5 year olds are more familiar with the terms “iPhone” and “iPad” than they are with a “bowl full of mush,” a part of me was also saddened by the realization. The next week, I shared this with a group of co-workers, who recalled similar conversations with family members over the loss of bedtime stories as a ritual among today’s children. In fact, a recent story in the “New York Times” even covered it. I’ll be the first to admit that it’s great to have electronic devices at the ready to tell my children stories, or keep them entertained in waiting rooms, store lines, or while I’m cooking dinner. I would even advocate for the benefits of many e-games and stories, and say they’ve improved my children’s comprehension of letters, shapes, and numbers. And I, along with many other parents I know, are often shocked (and quietly proud) at how easily my toddlers pick up electronic devices and seem to have a natural knack for using them. However, reading – real books – to my children is a cherished bedtime ritual as well, and one that I am disappointed to hear people argue is no longer the “norm.” As we delve further and further into the realm of gadgetry, e-reading, and always being “connected,” I think it’s ok that parenting and storytelling shift along with the times. As all generations note, everything in moderation. However, I agree that important rituals of reading, telling bedtime stories, and even visiting local libraries on a regular basis are childhood staples my generation must not lose. Likewise, I grew up with a small box of teeny tiny dolls, cleald worry dolls. Maybe a Guatemalan tradition? Not sure. I loved those! More for there cuteness than comfort, but there must be something to that.When my own daughter has experienced fear during the night, either my husband or I have held her and walked her around the house speaking in a soft, reassuring, sleepy time voice. We describe familiar things, There is the bathroom, your hoppity horse, our dog, the kitchen. And look out the window, there is Sam’s house. Everything is just the same except the sun is sleeping [or on the other side of Earth or whatever age appropriate language you choose]. This has helped both of my girls put their fears of the dark to rest. Fear is not rationale, but can be eased by positive experiences.If the fear is due to separation, then try kissing bedtime snuggly objects a bunch in front of your child and explain the kisses will be there all night. Or, put a picture of you or other relative nearby. And/or, play a white noise machine. They do wonders for lulling kids into deep sleep.